Following its release in Europe via Roadrunner Records, and in the Netherlands via CNR Entertainment, "We Are The Others" -- the third album from Dutch symphonic metal troupe Delain -- is out now in North America via Sensory Records. 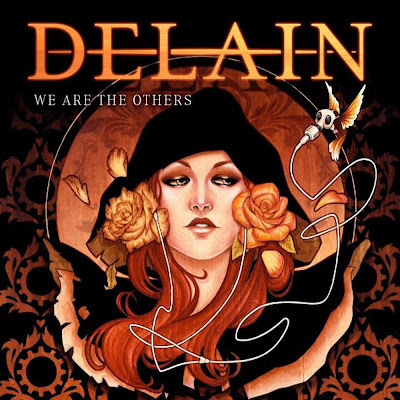 "As always fronted by the soaring, vibrant vocals of Charlotte Wessels and drenched in the glorious keyboard passages of band founder ex-Within Temptation keyboardist, Martijn Westerholt, We Are The Others boasts twelve of the most epic Delain hymns to date, with the North American version containing four additional exclusive live bonus tracks. "We Are The Others is an album littered with concepts in every aspect, from lyrically bridging fantasy with reality and actual events in history, to the steampunk-influenced cover art created by noted pop surrealist Glenn Arthur. DELAIN enlisted a massive production team for the recording, including Jacob Hellner (Rammstein, Apocalyptica), Fredrik Thomander and Anders Wikstrom (Scorpions, Backyard Babies), bringing every element of the album to life. The band met Fear Factory vocalist Burton C. Bell at Wacken Open Air, which resulted in a guest appearance on the album."